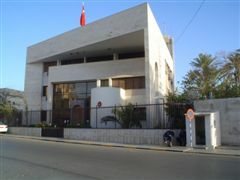 Rumours that Turkey will shortly be reopening its consulate in Benghazi have been denied. A senior diplomat at the Turkish embassy in Tripoli told the Libya Herald the reports were false and that there were no immediate plans to reestablish the consulate. The mission in Fawhat Sharki was closed in June 2014 shortly before Khalifa Hafter ordered all Turks and Qataris to leave eastern Libya. Turkey was in fact the last country to close its Benghazi consulate. Later that year, as security deteriorated in Tripoli following the Libya Dawn takeover, Turks also joined the general exodus of foreign diplomats to Tunis. However, the Turkish consulate in Misrata has continued to function, despite a grenade attack on its building. This January Ankara sent back a reduced complement of staff to reopen the embassy, making Turkey the second country after Italy to return its envoys to Tripoli.